Como parte de la estrategia #Public TV Reloaded, the National Television Authority began a new upgrade cycle for regional channels. This time it will focus on presenting some current generation strategies and presentation of audiovisual projects to be competitive in the domestic market and international levels, through recommendations based on experience and projection of consultants allies and large current CMO Producciones narrative design gurus. The dynamic look that creative and production of each channel and associated equipment producing work in a workshop on television projects and ideas that have, to generate the three most influential presentation lines when promoting a project or submit to calls. Hour: 9:00 a.m. a 1:00 p.m.
Place: Facilities at the Autonomous University of Manizales. 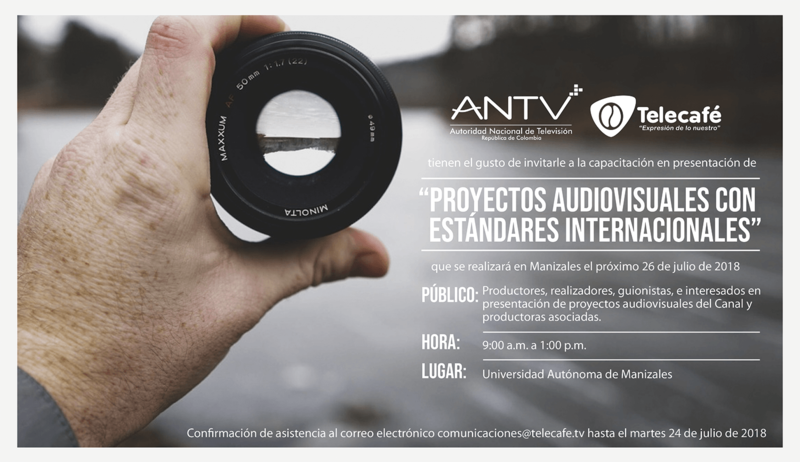 Public: producers, filmmakers, writers, members of creative teams and other stakeholders in audiovisual presentation and production projects associated Canal. 9:00. Presentación del ciclo y novedades de #Tv Pública Recargada, by Gabriel Levy B., Contents coordinator ANTV and a board member of the ANTV . 9:30. Presentation pieces for audiovisual projects: dossier, bible initial product, Final Bible. Led by Juliana Naranjo (researcher TVLab) and Sergio A. Urquijo (content advisor). 10:00. practical activity: redacción creativa y colectiva de LogLine, TagLine y Premisa Temática. 11:00. Elementos de la propuesta creativa y elementos transmedia. 11:30. practical activity: generación de la Circa y planeación de la macroescaleta. 12:30. Puesta en común y conclusiones. Confirmación de asistencia al correo electrónico [email protected] hasta el martes 24 July 2018.